offering superb views, and from lush green nature reserves to a landfill site which has been transformed into a beautiful park featuring a pebble beach, foot paths and an artificial hill! Guernsey. It’s what doggy dreams are made of! 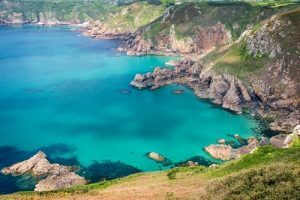 With its sandy beaches, cliff path walks, seascapes and offshore islands, Guernsey has been a tourist destination since the Victorian era. The Bailiwick of Guernsey is made up of five islands – Guernsey, Herm, Sark, Alderney and Lihou. There are also privately owned islands known as Jethou and Brecqhou. Did you know? Spring arrives four weeks earlier in Guernsey than on mainland Britain! Not only does this mean the weather heats up earlier, but it also allows for some unique and very beautiful plants, flowers and trees to grow on the island. If you and your pooch are looking for some early Springtime sunshine, a short(ish) distance to travel overseas and want to go a place where English is the first language, Guernsey is a great place to visit. Around 1,000 people still speak the island’s local Norman language fluently, Guernésiais with hundreds more claiming to have some understanding of the language. 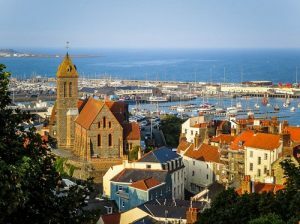 Until the early 20th Century, French was the official language of Guernsey for legal communications and all deeds for the sale and purchase of real estate was written in French until as recently as 1971. The loss of the island’s local language and the Anglicisation of its culture, which began in the 19th century, accelerated sharply when most of the island’s school children were evacuated to the UK for five years during the German occupation (1940 to 1945). French poet, novelist, and dramatist, Victor Hugo wrote some of his best-known works while in exile in Guernsey, including Les Misérables. His home in St. Peter Port, Hauteville House, is now a museum administered by the city of Paris. Similarly to Jersey, Guernsey is a Crown dependency, meaning it is not part of the UK but that does rely on the UK for military defence. Being an island, Guernsey serves up delectable locally caught seafood and is a must for all humans and dogs who love fresh fish, quality food and dog-friendly restaurants.  Whether you’re a local or visiting on holiday, sometimes (or always…) you just want to bring your dog with you! Now your best four-legged friend can join you for brunch to cure that hangover, an indulgent Saturday lunch with loved ones, or your celebratory birthday dinner and drinks with friends. We have searched high and low to find Guernsey’s dog-friendly bars, restaurants, hotels, doggy services and so much more – we are sure there is something for everyone (and every dog) here.